Our Board meets every second and fourth Monday of each Month at the Fallon Chamber. She hopes to foster the city's growth, but also keep the small town feel and closeness to the community. Lucy L. Carnahan is the Fallon Chamber of Commerce's Executive Director. She comes with over 20 years experience in management, mostly within our non-profit sector. She has built her reputation with staff building, supporting staff and volunteers with duties and direction with daily assignment. Is a working leader with the ability to guide teamwork. She has strong public relations and customer service. With the ability to organize and execute, supervise and coordinate administrative duties, projects including contracted services, special events, and marketing strategies. Along with this has become proficient community networking, planning, delegations, and motivation. Well organized, dependable, detailed-oriented and flexible with change. Has the ability to work well with management, staff and consumers, as well as independently. She has attended many State and Government contract negotiations, State Legislative Sessions, advocacy for transportation and human services. Additionally, she has become a successful grant writer. With a verifiable track record of consistently meeting and exceeding monetary records. Cindy has lived in Fallon and Churchill County for the past 40 years. Cindy has lived in Fallon and Churchill County for the past 40 years. She is a former business owner and currently works for a financial and Investment firm. Cindy recently finished her degree in Business Management with an emphasis in Finance. Cindy has been the past producer and executive director of the Miss Fallon / Miss America Organization for 20 years. Cindy loves to sing and perform any chance she gets and is an avid bowler. Cindy has one daughter who lives in Florida and two step-daughters who live in Reno and New Orleans. As owner of Mills Farm & Industrial, Grant brings 45 years of business experience to the Chamber Board. Grant Mills, is owner of Mills Farm and Industrial, he has 45 years of business experience. Mills Farm and Industrial specializes in custom forage harvesting, grain rolling, farm and heavy equipment rental, trucking, heavy hauling, crane service, and used equipment sales. Involvement in the community is important to Grant. He has served on a number of boards including; Churchill County Farm Bureau, Carson City Symphony board, CEDA, and was a founding member of the Nevada Agriculture Self Insured Group. Currently, he is vice president of the Nevada Agriculture Self Insured Group. A native of Churchill County, Grant graduated from Churchill County High School, attended University of Nevada, Reno for three years, and has taken courses over the years at Western Nevada College. Grant believes that in order to keep up with changes in technology and the work world both business owners and employees must have access to continuing education. That is why he serves on the committee to save our local community college campus. Valerie is the CEO/Treasurer of the Churchill County Federal Credit Union. Valerie Johnston is the CEO/Treasurer of Churchill County Federal Credit Union and current board member of the Chamber. Valerie began her banking career in 1987 at Valley Bank in Las Vegas, as a teller, and worked her way up through the ranks. In 1998 she made the move to credit unions, believing that credit unions served the communities where they are located better than banks. Prior to joining Churchill County Federal Credit Union, Valerie was the CEO of EW 401 Credit Union in Reno for 8 years. Valerie attended high school in Las Vegas and attended the University of Nevada, Reno studying Business Management. She lives in Fallon with her husband, Scott. They enjoy geocaching, cooking, camping and traveling. Their daughter, Leah is a pediatric dental assistant in Las Vegas and their son, Matthew works for UPS. Dr. Pamela Ferguson is originally from St. Helena, California, a small town in the heart of Napa Valley wine country. Dr. Pamela Ferguson is originally from St. Helena, California, a small town in the heart of Napa Valley wine country. She attended college and veterinary school at the University of California, Davis. Following graduation she was looking for a small rural community to establish some roots. She moved to Fallon in July 2011 to join Lahontan Valley Veterinary Clinic as an associate veterinarian. Shortly after moving to Fallon she met her husband Jason Ferguson who then started Nevada Dental Arts with his partner Tomas Kutansky in March 2012. When not working her husband and herself enjoy supporting this wonderful community and embracing the perks of rural living. We enjoy the great outdoors, traveling and spending time with their new baby girl Emma. She also personally enjoys homemaking and have a passion for agriculture and farming in this great community of Fallon, Nevada. She feels blessed to raise her family here and be able to call Fallon “home”. Angela moved to Fallon from Pennsylvania in 2005. She has worked for Financial Horizons Credit Union for the last 11 years and is currently pursuing her bachelors and then eventually her master’s in business. Over the course of her 11 years at the Credit Union she has earned her financial counseling certification and several IRA professional certifications. She has been the branch manager in our Fallon branch since 2010 and has worked hard at getting her presence known in Fallon with several community projects and fundraisers. She has fallen in love with Fallon and the people that live here. She feels blessed to raise her family here and be able to call Fallon “home”. I am proud to say that the home of the Greenwave is home to me. Robyn Jordan is a locally grown Fallon, Nevada resident, having graduated from CCHS in 2012. After high school she attended Western Nevada College and the University of Nevada, Reno. She has been married to Joe Jordan since 2015. Robyn loves Fallon’s small-town atmosphere, and is comforted by her first-hand knowledge of how caring and supportive the local residents are. She states that it has been a privilege to develop her career in such a supportive atmosphere, especially knowing that if she ever needs assistance with any of her many projects there is always some around to lend an ear or a helping hand. Robyn was the Executive Director for Fallon Festival Association, Inc., handling administrative duties and planning event activities for Fallon’s Cantaloupe Festival & Country Fair. She is currently the Community Liaison at Lumegent, which allows her to do what she loves most - work with the local community. Through her job at Lumegent she has been able to maintain the role as consultant for the Fallon Cantaloupe Festival & County Fair, which she has done for four years now. When Tomas Kutansky, DDS said “I Do”, he not only became part of a new family, he also became a member of his new family’s profession—dentistry. His wife comes from a long line of dentists and Dr. Kutansky soon discovered he also had a passion for helping patients’ improve their health through dental care. 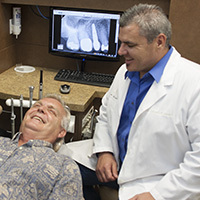 In 2012, Dr. Kutansky teamed up with Dr. Ferguson to open Nevada Dental Arts in Fallon, NV. He is proud to be a part of a dental practice that is kind, caring and has a strong sense of community. And, keeping with the family tradition of dentistry, his wife is also a hygienist at Nevada Dental Arts. Prior to receiving his Doctor of Dental Surgery from Loma Linda University, he held a Bachelor of Science degree in Dental Hygiene from the same university. He also served in the United States Army as a Combat/Medical Specialist in Active Duty for eight years. Dr. Kutansky completed the Honors Program in IV Sedation and Oral Surgery which enables him to hold a current State of Nevada IV Sedation License and perform oral surgery in his office. Today, Dr. Kutansky is a firm believer in preventative dentistry. In fact, his mantra is prevention is easier and cheaper than the cure. He urges, and supports, all patients to take an active role in their oral health. Dr. Kutansky has called Fallon home since 1994 and when he’s not seeing patients, you might find him out hunting, riding his Harley Davidson or traveling. He enjoys spending time with his wife, daughter and their schnauzer, Charlie. Dedicated in following her passion of helping out in her community. Bekki Taylor has a love for rural living in Northern Nevada. She is the Regional Manager for a local non-profit; JOIN Inc.
Bekki was born and raised in Reno, NV. She attended Hug High School and went straight to college where she studied Psychology. Traveling the world and worked in Papua New Guinea in communications then Tehran, Iran as a Security Liaison. She came back to Nevada and started her career in the gaming industry where she has a tremendous financial background. She has also spent eleven years as a CASA (Court Appointed Special Advocate) for children in Northern Nevada. She and her husband have welcomed one adopted daughter into their family. She has a great deal of other family members that live in Fallon and surrounding areas where she is dedicated to follow her passion of helping out in her community. Likes adventure in serving this community that she loves. Kimberlee was born and raised in Sacramento California. She attended Sacramento City College and then moved on to University of Nevada where she met and married her husband in 1983. They have one son together and he is now off to college in North Dakota. Kim started working at Albertson’s superstore where she is now retired. She currently holds a position at Banner Hospital in the administration business office. She has volunteered to hold the position of president of the Greenwave Quarterback club which has grown exponentially since she has been in office. As of this year she will retire from that position and is looking for her next exciting adventure in serving this community that she loves. © Copyright 2015 Fallon Chamber of Commerce. All rights reserved.